We talked about gravity. 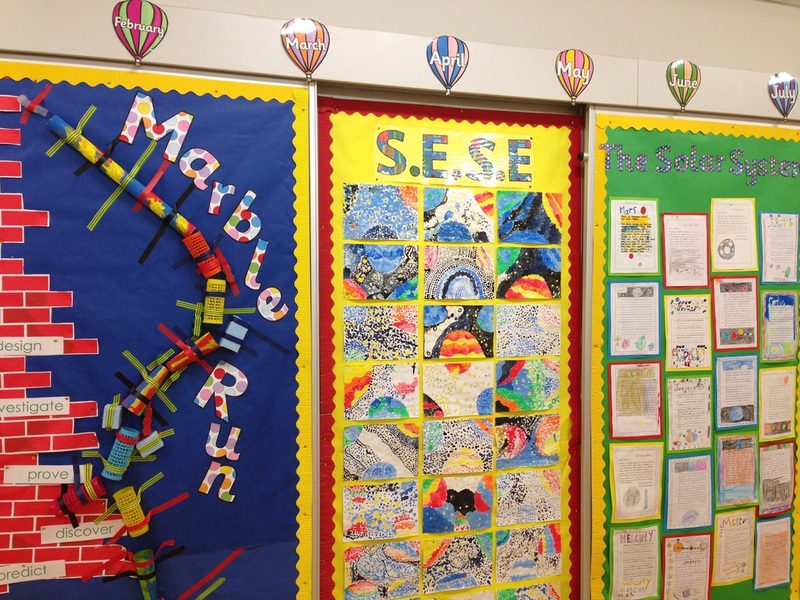 We learned that gravity is a force that pulls us down towards the centre of the Earth. We dropped a pencil and a book from the same height at the same time. We thought that the book would land first. We were surprised to see that they reached the ground at the same time. Gravity will always pull just as hard on any object, no matter how big or heavy it might be. 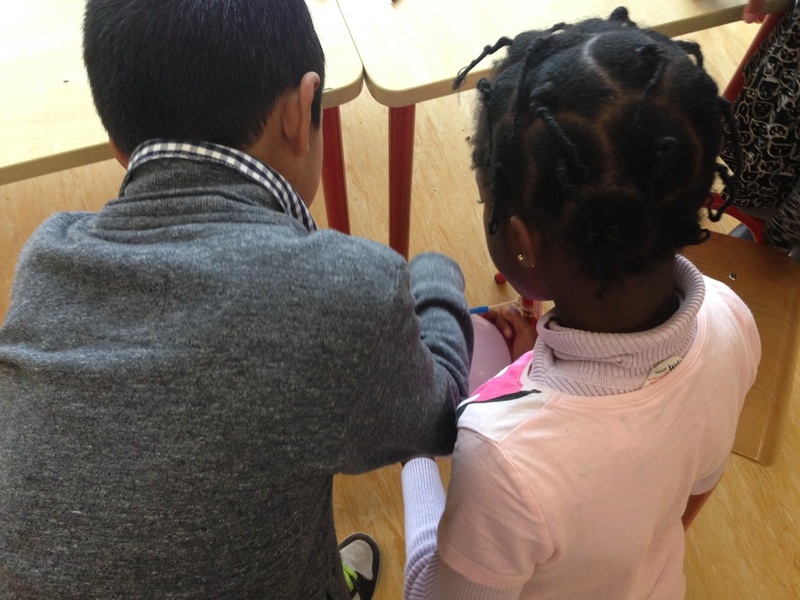 Click on the Forces page to read about all our experiments with forces! But then how do birds fly? We dropped two pieces of paper to the ground from the same height at the same time. One was scrunched up in a ball and the other was flat. The flat piece seemed to float down to the ground and took longer to get there. We decided that this was to do with the air catching in it, like birds’ wings or a parachute. 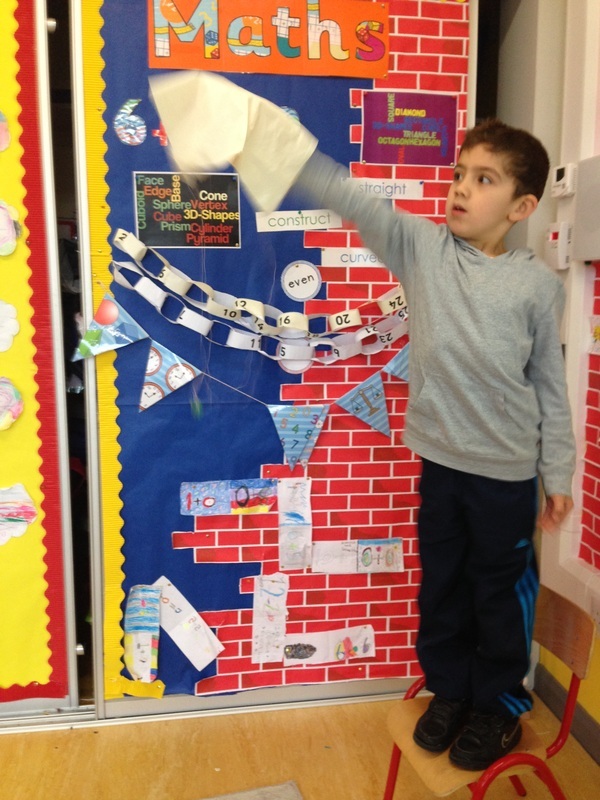 We made our own parachutes using a tissue, 4 pieces of thread, a piece of Lego and some sellotape. The air caught in the parachute and brought the Lego safely down to the ground! We listened to the story of the first moon landing, learning that the first man to walk on the moon was called Neil Armstrong. There is less gravity on the moon than there is on the Earth. That means that you can jump much higher on the moon than you can down here! We watched a video of an astronaut walking on the moon that proved this! 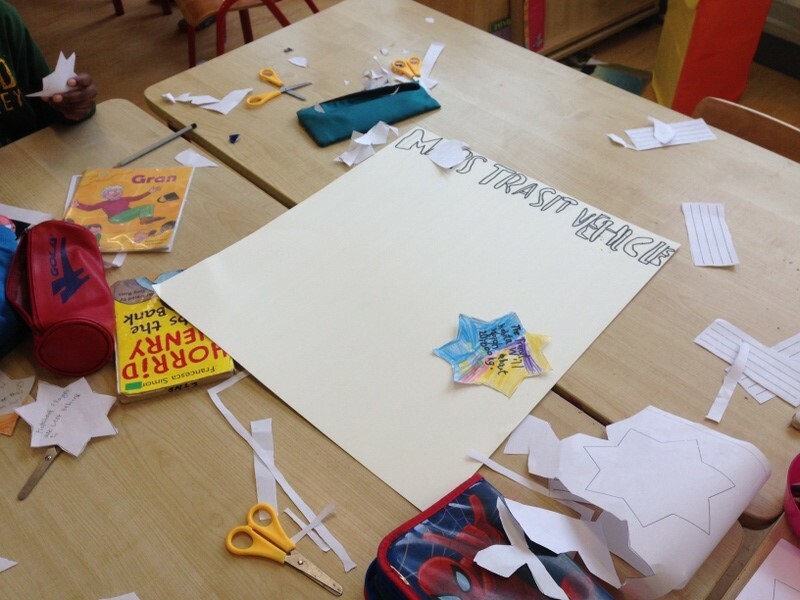 In Science, we made our own rocket! We put some string through a straw. We tied the string to two chairs. 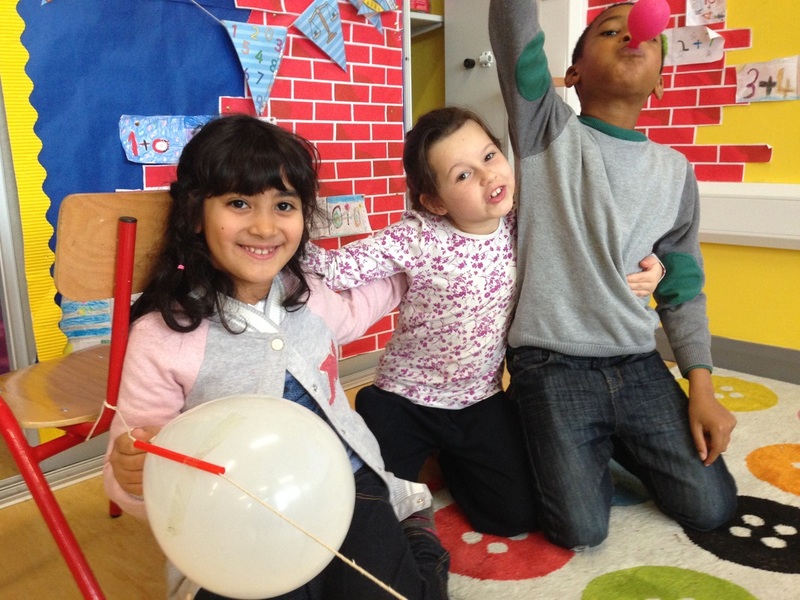 Then we blew up a balloon and held the end so that the air couldn’t escape. 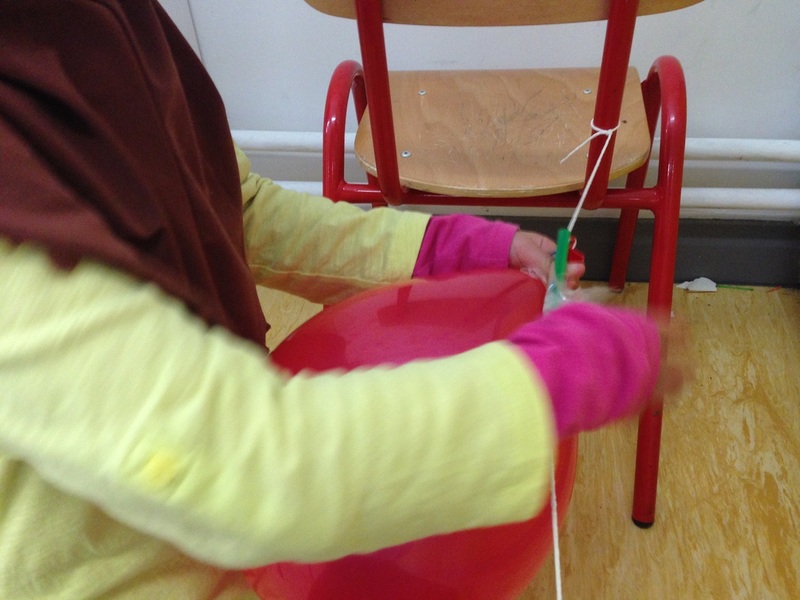 After that, we sellotaped the side of the balloon to the straw, pulling the straw back to one end of the string. 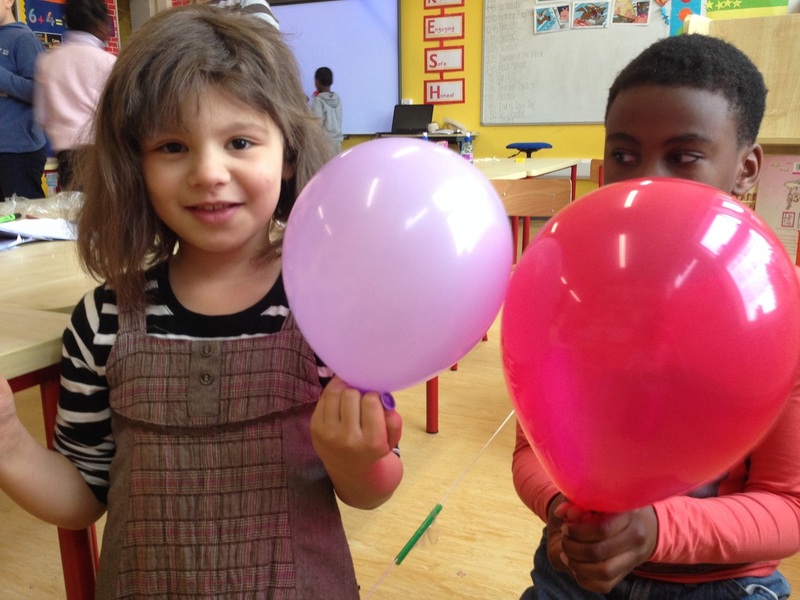 When we took the clothes peg off, the balloon flew from one end of the string to the other at great speed. The air coming out of the back of the balloon pushed the balloon forward. Have a look at this video! 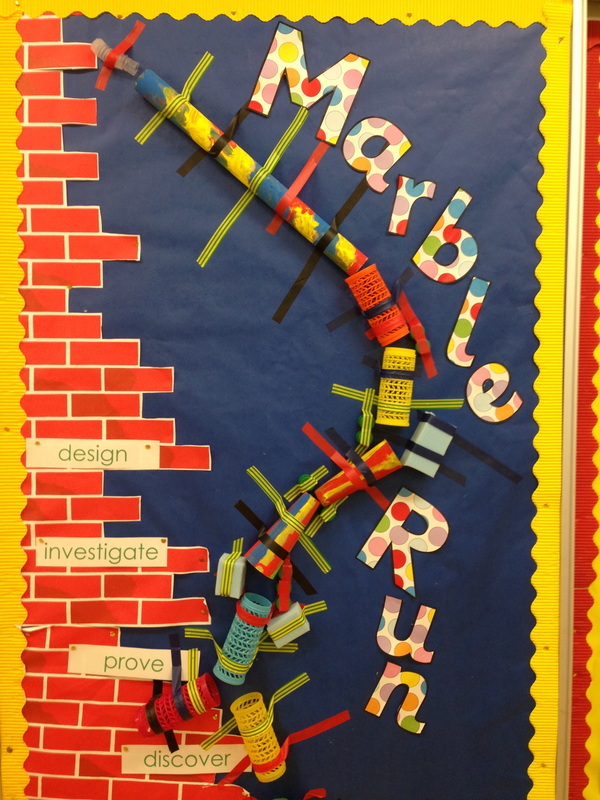 Our rocket experiment taught us about forces. The air coming out of the back of the balloon pushed the balloon forward. This is how rockets work. The hot gases coming out of the back of the rocket pushes them upwards! 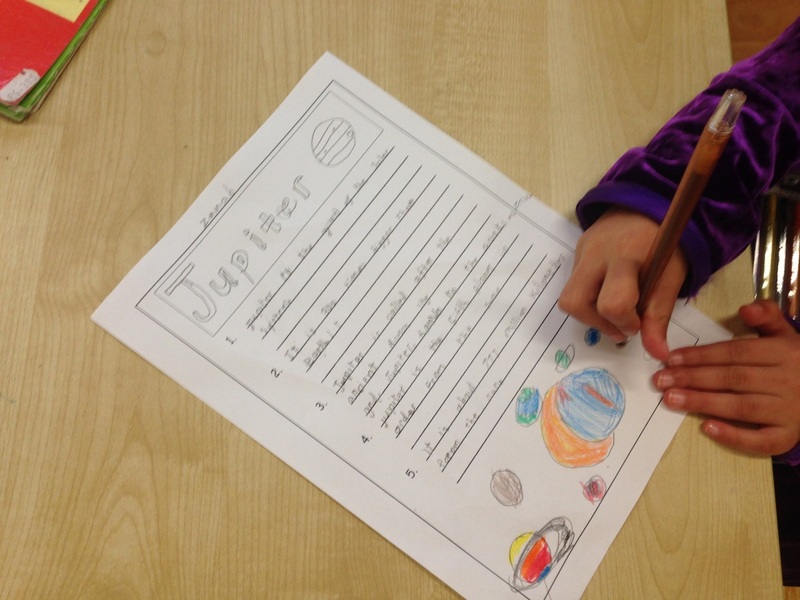 We gathered lots of facts about the different planets and used them to create our own fact files. We learned a trick to help us remember the planets in order of their distance from the sun. My Very Eager Mother Just Served Us Nuts = Mercury, Venus, Earth, Mars, Jupiter, Saturn, Uranus Neptune. This song can help us to remember too! We learned that the first animal to enter orbit was a dog called Laika. 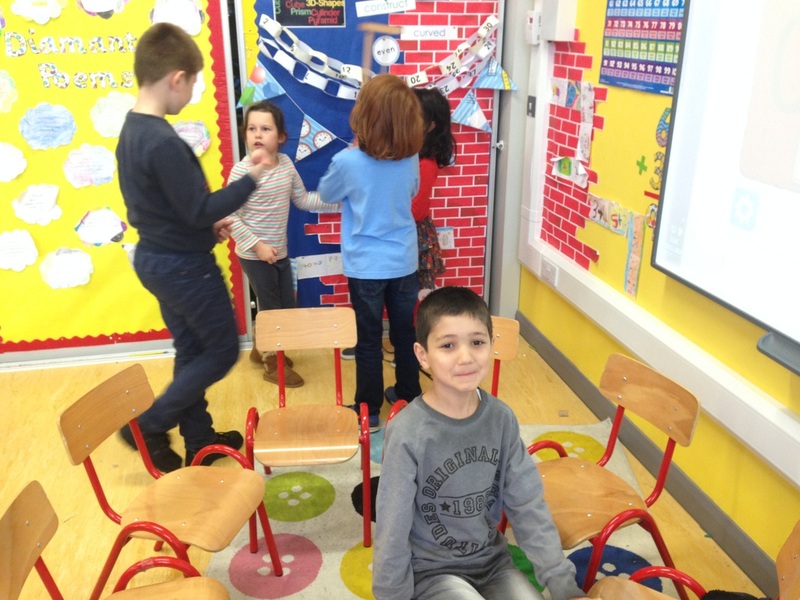 We made a space timeline that shows lots of important events in the history of space exploration. We watched a video of the first spacewalk. 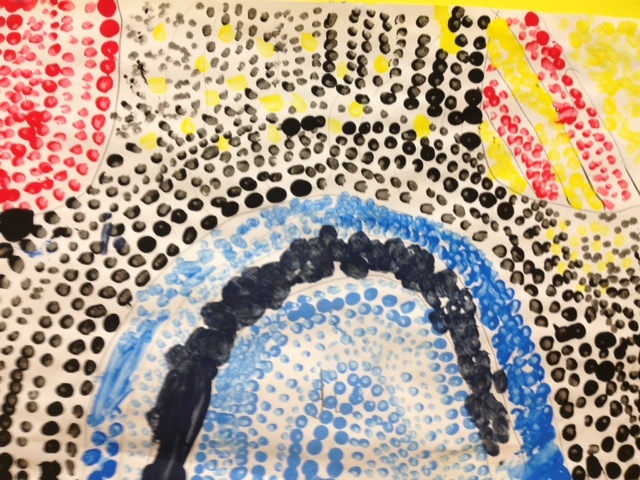 In Art, we learned about a style of painting made famous by Georges Seurat called Pointillism. 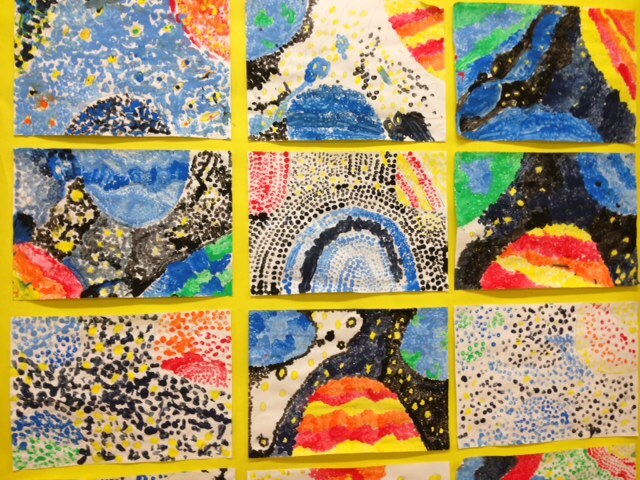 We used this technique to create some beautiful paintings of the solar system. 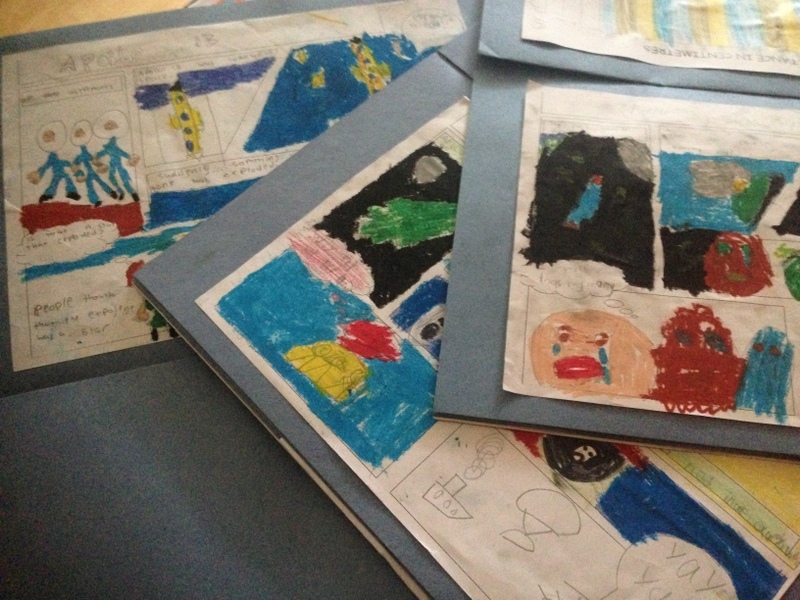 We used a picture of the moon landing to inspire some creative writing, while in Drama we imagined that we had arrived on a distant planet and had to communicate with aliens without a common language. The audience then had to guess what the original message was. We learned all about an historic event- the first moon landing. 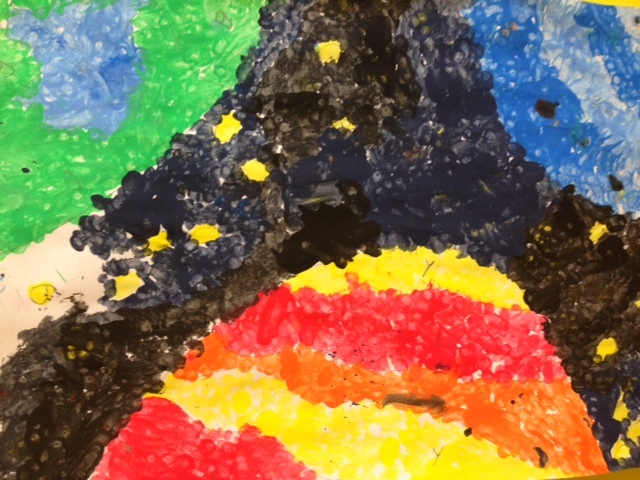 So it was extremely exciting to find out that history was being made as we worked on our solar system project! On 12 November 2014, the Rosetta mission landed its Philae probe on a comet. This is the first time in history that this has ever happened! The Rosetta spacecraft was launched in March 2004, which means it has been chasing this comet for over 10 years. This is not surprising given that the comet, which is 2 and a half miles wide, travels at up to 80,000 miles an hour! The spacecraft and lander are controlled by the European Space Agency here on Earth. The ESA have a lovely website especially for kids that can help us to learn more about the Rosetta mission! Have a look!! The Rosetta spacecraft separated from its Philae lander after 10 years of travelling around space together. The lander, which is about the size of a washing machine, now has the job of gathering scientific information about the comet. It recorded what it sounds like on a comet. Follow this link to listen!!! 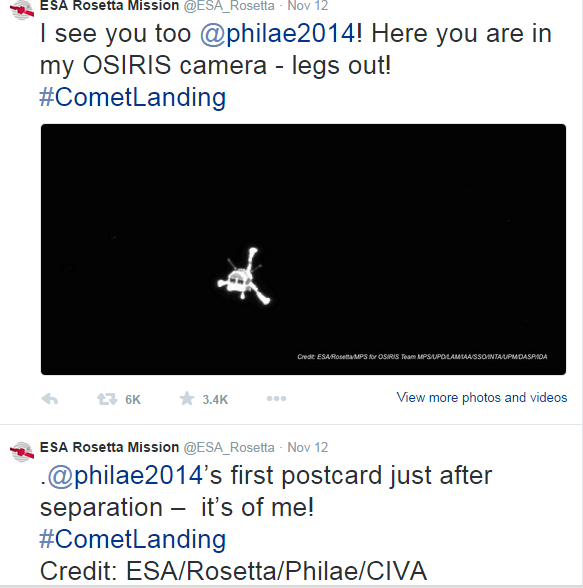 The Rosetta spacecraft and the Philae lander send each other messages on Twitter! These messages can keep us up to date on important information about the mission. 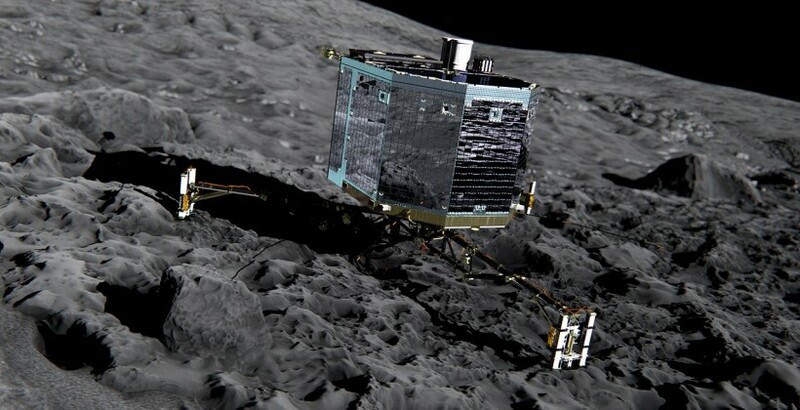 The Philae landed in the shadow of a cliff, which means that it cannot use its solar panels to recharge its batteries. But as lots of us cleverly pointed out, scientists love problems and mistakes. They help us to learn!! We are keeping an eye on Twitter so that we know what's going on up there!! Follow us @2ndRedEsker. 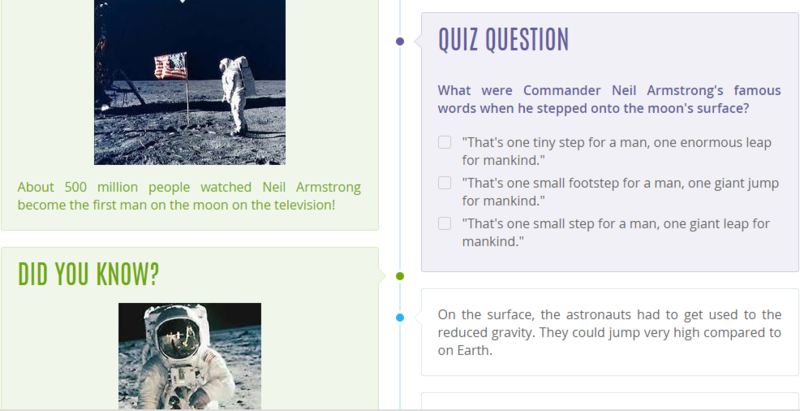 As we learned in History, Neil Armstrong described the first moon landing as 'a giant leap for mankind.' The Rosetta Mission has certainly been another, while the Mars One Mission is being described as 'the next giant leap for mankind.' By 2023, it is hoped that there will be humans living on Mars! Have a look at this Prezi by clicking on the link below! 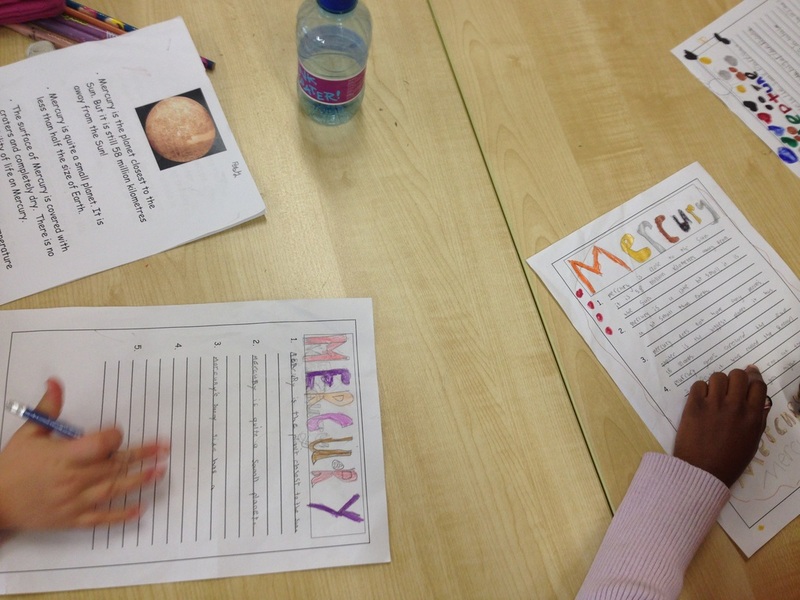 We worked in groups to research a particular area of the Mars One Mission. 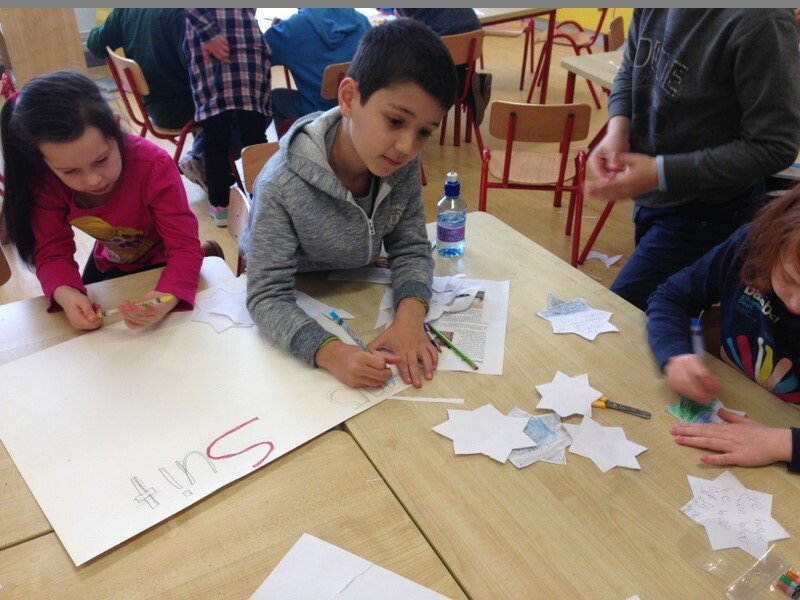 One group did a presentation about the Life Support Units, another compiled facts about the Rovers, another researched the Mars Suit, while the last group looked at how the astronauts would get there in the Mars Transit Vehicle. One of the scientists who may be chosen to be a Mars One astronaut is an Irishman called Dr. Joseph Roche. 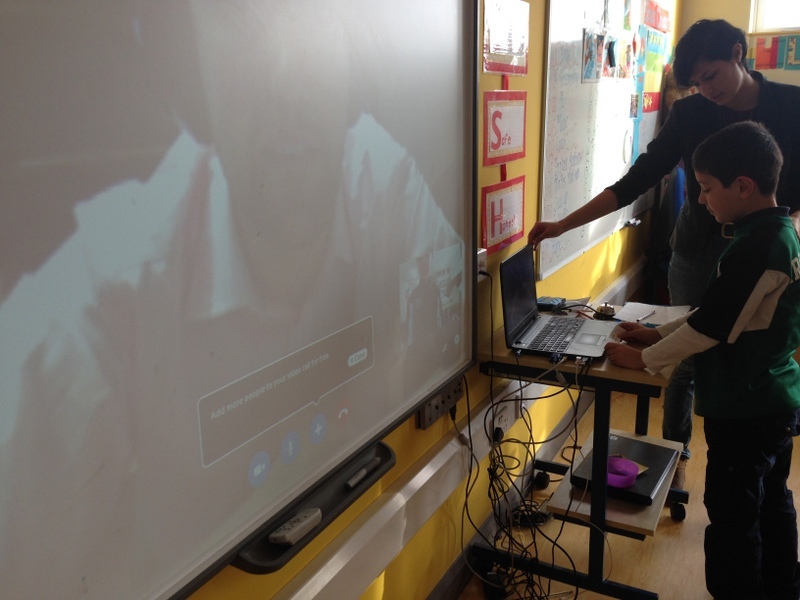 We were lucky enough to be able to interview him on Skype! 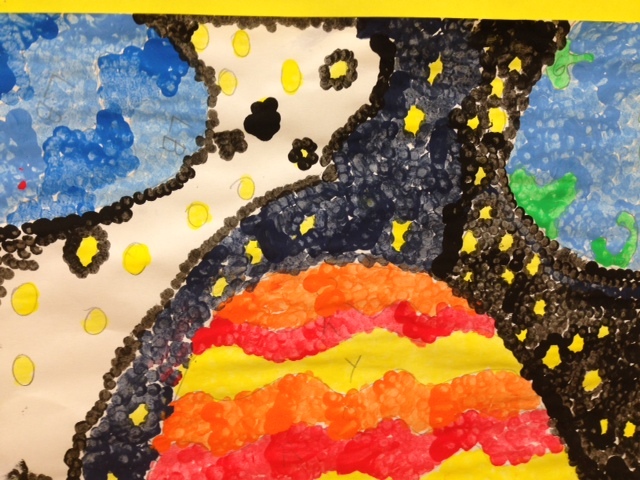 Some of our favourite facts were that the sky is red on Mars, that the astronauts are not even allowed to bring a football and that they may have to eat insects!!! We asked some very interesting questions such as 'We know that there will be air pumped into the Life Support Units, but where does the air come from?' 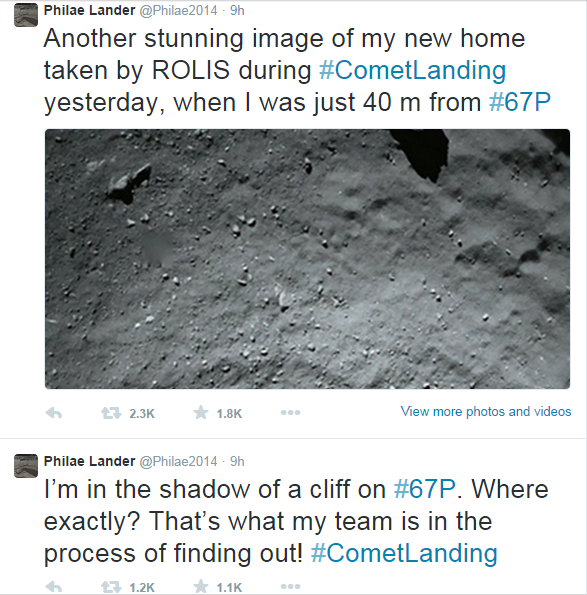 and 'The pictures of the comet taken by the Philae Lander look dusty. Is Mars rock very dusty?' 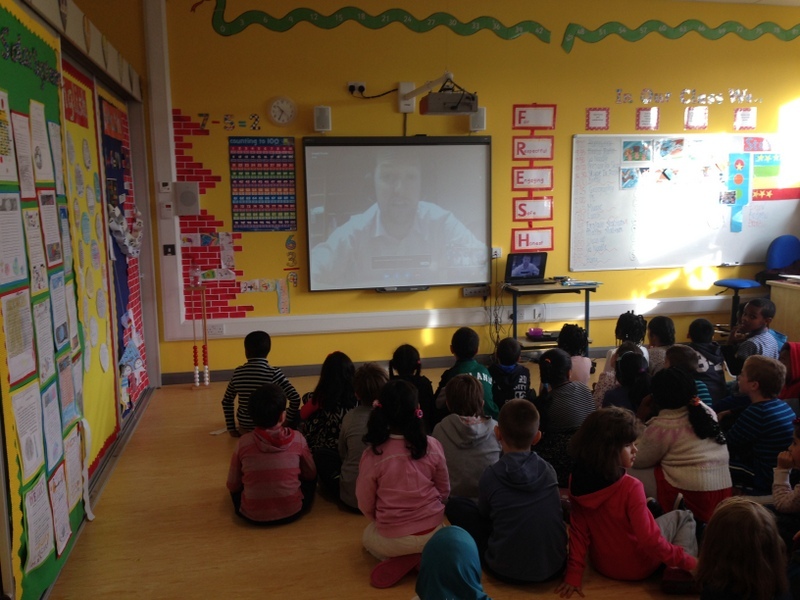 Dr. Roche answered all of our questions, telling us that the astronauts will be able to make oxygen from the soil and that you could probably make a sandcastle with Mars dust once you had some water! Dr. Roche told us that he does not know what his first words on Mars would be. He asked for our suggestions!! You can leave your ideas on the Recently page. We will tweet our best suggestions to him! 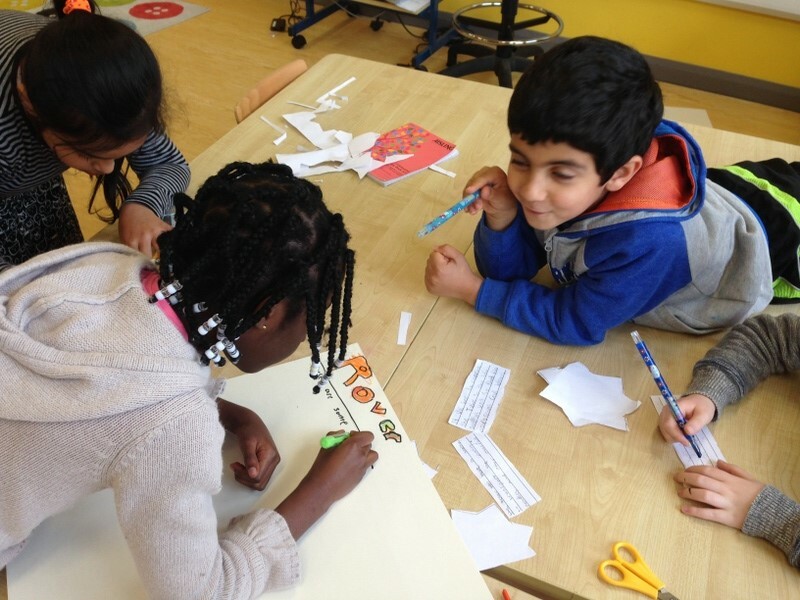 We tested our knowledge with some quiz questions on an interactive timeline. 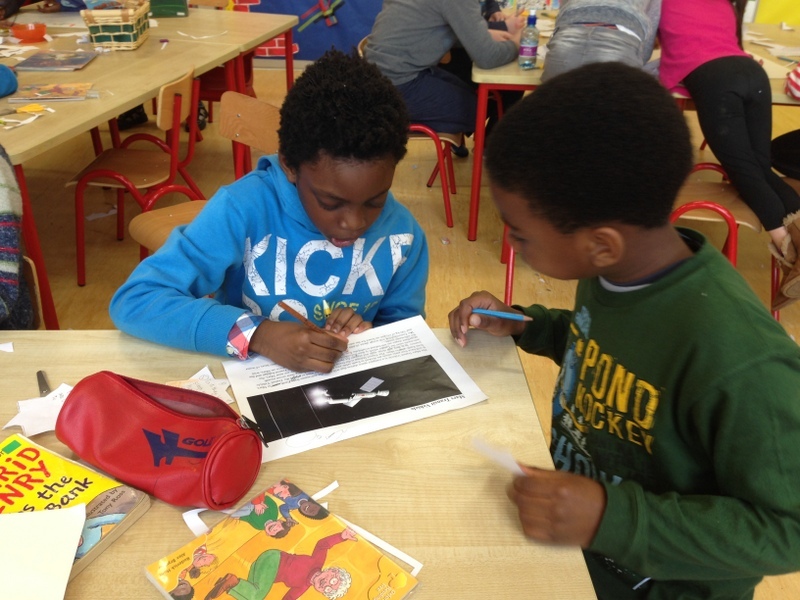 We listened to the story of the Apollo 13. It was a very frightening and exciting true story! 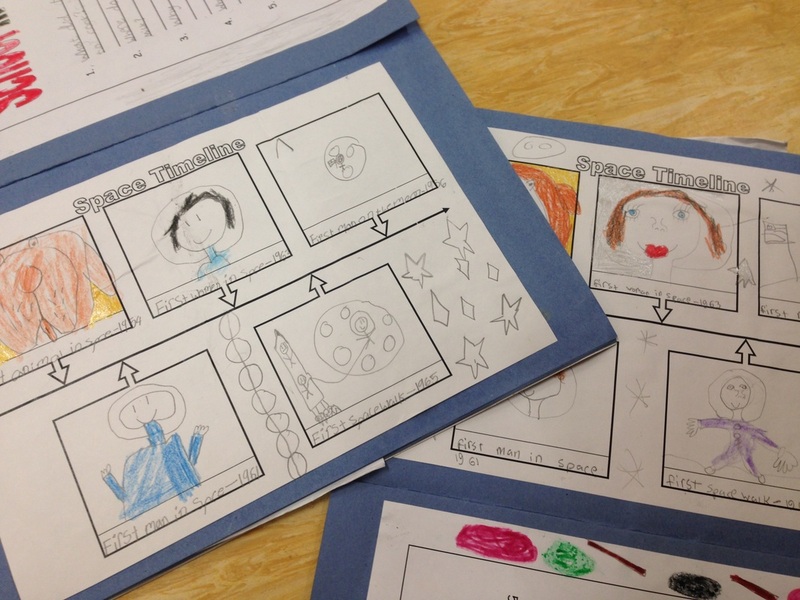 We made these comic strips to retell the story through illustrations! Our brain breaks with GoNoodle.com are also helping us to learn all about the solar system. Our journey with Airtime Space has taught us many interesting facts. 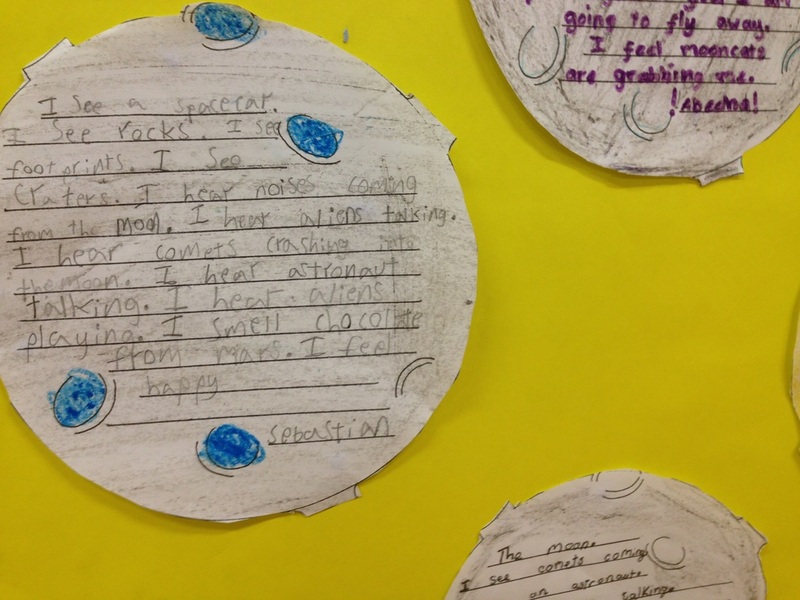 It is wonderful to see so many children taking an interest in the solar system at home. 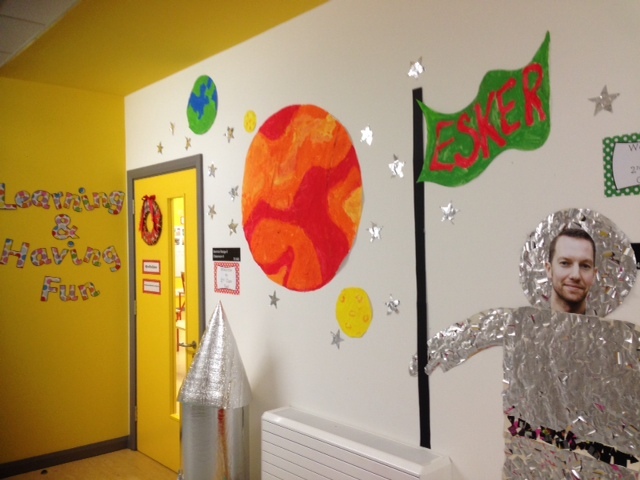 We may have some future astronauts in 2nd Class Red!! Stay curious! !